Looks the like some of the crowd has come around to Sabrina’s side after all. A little payback from Ultragirl! Is it a start…or a finish? Vote to see what’s coming Wednesday! 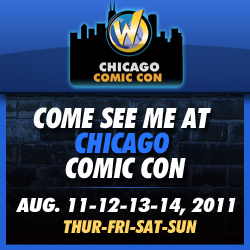 Join me this weekend at Wizard World Chicago where you can find me at table 3731 where i’ll have comics, graphic novels, prints, posters and working on commissions! If you’re going to be around, please be sure to come by and say HI! I figured it out without help. Nice one, ‘Brina! Thank you madame, your mother wears combat boots. Doesn’t Sabrina know it is rude to speak a foreign language in a foreign country? In fact most countries like it when people at least try speak the local language. As long as they don’t screw up on purpose. I’m from Montreal and I appreciate people who try to speak french. I’ve been to Italy and most waiters admitted to have apreciated me trying to speak italian. BTW, Sabrina’s french isn’t all that bad here. But if she ment “could I have another one (Slap)”, in french slap is a feminine noun so you say “Une”, not “Un”, designing a masculine noun. Props for the effort though. Judging by this and the VI I’d say it’s ON! And boss, good work on the faces. They speak volumes. Being a show off Brenda? Saying you know what they said but refusing to share it with me. Puts a tootsie roll in your slipper. No, but Sabrina is looking very lovely in panel 1 and I looooove the face she makes in Panel 4. Mmm, that’s good spite! Taking everything of theirs for yourself… Well done, Sabrina! Crush her spirit. If she’s outraged now, she’ll be desperate soon. And if she’s desperate, she’s halfway to surrender. That’s how heroes play head games! I like Sabrina. I like her a lot! Speaking of head games you should have seen me in action last Tuesday night, now that was a series of head games. BBD I don’t want you sitting on Brenda while she is in the hospital. ‘Brina is looking super cute today! Think how cute she would look in Kitten ears! …Trying to hint at something? Hmmm? Think that is hard, trying being French and speaking English. I believe that it’s supposed to be quoting the line from Animal House, which had a frat guy getting hazed by being paddled, to which he was required to shout “Thank you sir, may I have another!”. I think this is a grand way for Sabrina to taunt Chloe. This is going to be an epic and brutal match. I hope Sabrina treats Chloe like a good book: Opens her up and see that she’s red from cover to cover. So let me get this right Coel, you want her to find the knife in Chloe’s bag and cut her open? Now that is just plain evil. Chloe is a good.. she like fans, she cared for fans.. while others are traitors..
Chloe expose Sabrina as evil.. Sabrina is evil..
You might have a point there MGC. I heard that Sabrina is really tight with the writer. Sabrina must call her mademmoiselle..
Madame is used for married female..
Chloe is married to her job. Wow, Chloe has her own language? Did she call dibs or something? Anyway, awesome page – can’t wait for the rest of the fireworks to start! More stage setting. I predict we’ll finally get down to the fight on the last panel Wednesday. Hahahahahahaha. And people thought that Sabrina was just a one dimensional wrestler. Here she is, playing mindgames with Chloe, and quite effectivly too. Cloud your opponent’s thoughts with anger, while keeping a cool and level head yourself. It’s as old as the Art of War. And on a different note, why the hell shouldn’t Brina parlez-vous a little française? Not like DeSad has a copyright on it. Besides, she butchers English often enough. Chloe may have brought a kendo stick, but this is when Sabrina reveals she brought Spaceballs: The Flamethrower! Thanks Champ! Yeah, the phrase has been around a few different places and now at a French PPV! Thanks Franath! Sabrina didn’t quite nail the translation but that’s okay because it’s Ultragirl. lol I had two years of French in high school and I can’t remember a lick of it. Coel, if Sabrina has her way, she’ll end up resembling the god of war after this fight with Chloe. MGC, I think Chloe showed her true feelings for the fans when she no-showed the Appreciation Party from her fan club. To borrow jpiv’s comparison, Chloe is like Cena and Sabrina is like Punk. jpiv, I’m glad that Sabrina’s pleasant surprise came over. She was gearing up to be booed all night but things have a funny way of working themselves out. Of course, we know that fans/marks can be finicky. Darkmark, or maybe the first! I agree Cookie Ogre. If and when we get this alleged birth certificate, let’s get records of the schools she went to as well! Donny, it seems that Sabrina has a gameplan! And part of it is thinking instead of just reacting. I can’t promise how long she’ll stick to it, but there it is. Awwww That’s so cute! I was gonna say I like it too and ask where you got it. I’m thinking of changing my look. Thanks Champ! You can thank my dad, Rick “The Golden Goliath” Sinclair (retired! So don’t go encouraging him! ), who had it custom made after I finished my physio recovery and got back in the saddle. He’s awesome like that. I’m always changing my look though, some people even think I have done so while they were stood there talking to me, though can’t fathom how! Actually the only thing sabrina should call De sade is whats the french word for dumb stupid tramp? De Ssade is mad that someone else spoke her language what an egotistical little snot. If anyone needs any humility beaten into them its De Sade. It could well come to a beatdown. But it would be nice to see some wrestling too. Wouldn’t it be sweet to see Brina make Chloe admit she’s the better wrestler? You know I’ll be swinging by a couple times throughout the weekend. yeah that would be awsome Brenda hehe especially if she used a submission to do it. 1) “Merci Madame. Puis-je en avoir une deuxième?” (a slap is “gifle”, so feminine)- this is neutral, if slightly sarcastic. 2) Merci bien chère dame. Me feriez vous l’honneur de m’en donner une deuxième?” (literally: “Thank you kindly dear lady. Would you honour me with a second one”; only people who have really good command of French would say it, as it echoes the slightly “precious” past of the french language). 3) “Charmant. Tu réessayes un peu, pour voir?” (lit: “charming. Try again, see what happens?” dry, and convey linguistic mastery as well as a more… slang… tendency). 4) “Jolie baffe! surtout, ne te gènes pas, répète!” (lit. “Nice punch! Above all, don’t feel bothered, go again!” – as dry as earlier, a bit less on the “illustrious” side). (also, if I can help with french stuff, during this match or in the future, please do feel free to email me (email entered in the appropriate field), I’d be honoured! So I see Chloe isn’t wearing as much make-up as Sabrina for some reason.